Hi viewers, what a wonderful weather day it has been today, big puffy white clouds, gusty winds and slightly warmer than the nothing degrees I have been experiencing lately. Washing done, hung out to dry, ironed and just put it back on again, nothing like the smell of clean cloths and sheets. 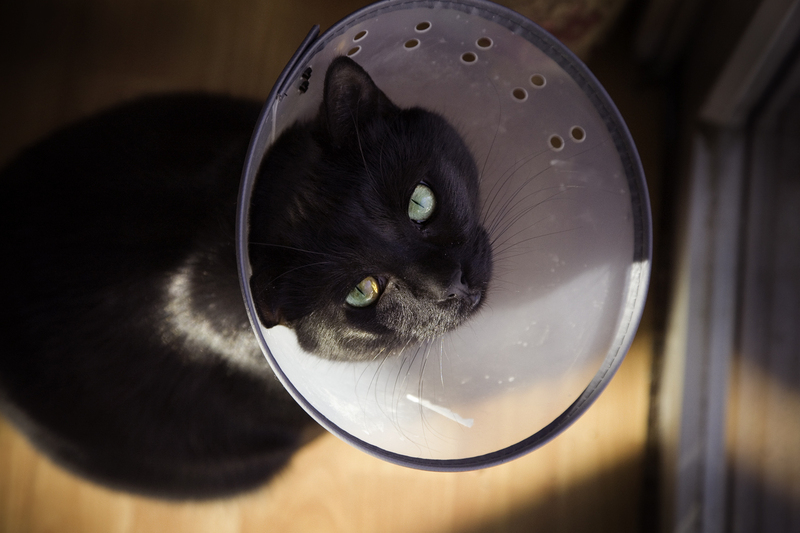 Anyhoo, who is this little cutie I have presented to you today and what is with the cone of shame? Well let me tell you because you seem like a friendly reader, this is my substitute baby James who sadly has to wear this oh so fashion less collar because he is a neurotic licker and I am hoping that this will help him grow some fur back on his wobbly belly. James is the reason why I have lived in an almost dream house in New Jersey for the past 3 years with my now fiancé, before this we where living catless in a rented apartment half an hours drive away from where we are now. My fiancé had a cat in his past who he doted on, he still has a tear in his eye when he talks about him even years after he sadly left this earth, I have always had a cat or cats and upon leaving for the US I had left my behind with my mother, sadly cancer got to her and she was also put down, the cat not the mother. It was agreed that we needed a cat so we asked our landlord if we could have one and she said no, so we said to each other later that same day, “well, if we can’t have a cat here, we’re moving” and that is exactly what we did. A month after being moved into our house the cat mission began, it had to a rescue (that was a definite for the both of us because every one deserves a second chance), it had to be relatively healthy and it had to be one that wouldn’t rip your face off in the middle of the night for a midnight snack. We searched the pet stores on their adoption day and although they where stupidly cute, we were not looking for a kitten, not that we don’t like them, but it is not fare on the older dolls who need a home more. My fiancé’s friend so happens to work at an animal shelter, which has since sadly closed due to under funding, and although it was a long trek to get their, it was worth every single mile in my opinion. We got the shelter and immediately the staff there are so welcoming and you could see what a good job they where doing, the cats where all in good condition, the building was warm and comfortable and there plenty of room for both animal and human movement. After half an hour I am still having trouble finding “the” cat to take home, they were all just such heart breakers, even the one that hobbled though to greet us on limp limbs and barely any teeth leaving drool marks everywhere, the poor sod was so pathetic that I couldn’t help but want to take him home, Sadly he was ill and was looking for a home to die in basically and neither My fiancé or I could watch that happen. During my walk around the three rooms I left the fiancé sat in the corner in the second room next to a cage that no one seemed to be bothered by, but each time I walked in to see him, this little black paw was always poking out of this cage and letting out a friendly call of “hello”. After a while I sat on the fiancé’s lap and this cat did the same thing with me, the little paw poking out waiting to be petted, calling out “look at me”. I suppose I never really saw this little beauty at first because he was one of the very few that were not allowed out the cage, this is usually a bad sign of a violent face ripper so when we enquired why he was locked up, the answer was that he was frightened of cats, yes you saw that right, he is petrified of cats being near him, he will not attack but he will scream. The staff at the centre cleared the room of cats and let us open his pen and spend a few minuets with him to do the usual checks of no lose bits such as legs or ears, can stand being touched, has a cry that will not wake the neighbours at 2am and silly things like parents do when there child is born. He is not what you would call a wantable cat because he is black, no not black, seriously jet black with different colour eyes and a huge chunk of people in the world think they are the sporn of the devil and will have nothing to do with a black cat, but that’s nonsense in my opinion, I have had a black cat in the past and he was a love and this one had shown no sign of this as he purred heartily in my arms. He did that look, you know that one where they tilt their head to the side and that slow blink, my heart just about flipped and the deal was sealed, he was ours. During the signing of paper work we found out that he had just been left somewhere and a passer by had taken him to the shelter and that someone who was either drunk or very imaginative had called him Bowdergaurd. Now, I have heard of silly names people call their pets and now their children but seriously folks, Bowdergaurd, even the cat hated it so after we had got him home he was relieved to be re-christened James. James is a lap cat who thrives with company he knows, he is shy at first with strangers but give him a little while he will warm up to you and be your best friend. He has only two fears which I know of, the steam mop and being left alone, everything else he doesn’t give two hoots about, he even isn’t a stranger to the bath, he will sit on the edge and let you put bubbles on him and on the odd moments we have washed him in the shower without too much fuss, all in all, he just doesn’t care. As for the being left, he is clingy, seriously clingy, for instance when we go up for the night and switch off all the lights he will stay on the sofa for about 15 minuets on his own and then he will cry and will not stop until you call for him or if he is in a lazy bugger mood until I get up and fetch him. Tell you one thing, he is super smart and because of this it is hard to play with him, not in a way that you wouldn’t play poker with him but the laser pointer game was sussed in ten minuets and refuses to play with it because he knows where the light comes from. We buy him toys and spend James time with him but apparently they are not the right colour toy or the right texture, oh trust me after two years we know that he will only play with black furry toys and on the odd occasion a pink fluffy toy, you try find a cat toy like that, it is not as easy as you think. The toys on his list at the moment are a small square of my bedroom carpet and the one that really gets him going is those rubber insoles you put into shoes to give you arch support, he goes nuts over that. The collar is a new introduction in his life and to no surprise he hates it but he deals with it, we hate having to put it on him but his neurosis for licking has got so bad that his back ankles where starting to get red raw and very painful looking, we have tried putting bandages on his legs but he gets them off with no trouble. His tummy is a mess, his fur has always been thin there but he just licks and licks and more and more bald spots where appearing and then scabs would appear and no matter how much we watch him we can’t watch him all the time. Its an ongoing problem we have had with him and the cone has been the best treatment so far but I sadly think we have maybe got their too late and his fat belly may never have normal hair on it. We have been to the vets, he has had potions and lotions and remedies and baths and powers and changes of bedding, we have changed our washing power but in the end it is his way of dealing with stress. He is a very happy cat, he loves being with us and we treat him as if he where our child, we think the world of him but he cannot cope with even the slightest change which unfortunately has been on and off since he has been with us whether it is repairs on the house or me going backwards and forwards across the seas, we think that he was abandoned as a kitten and he is petrified that it would happen to him again, that will never ever ever ever happen again, he is a 100% adorable stayer in this family. I am currently in England as I write and every time I call the US I have to spend a few moments on the phone with James and he purrs and when I am on speaker phone he calls in the background, he knows it me and it sure does put a smile on my face but it makes me miss him even more so. He is a ham and will happily pose for my camera, just mine which is quiet satisfying it has got to the point that when I had to draw out instructions on how I did my lighting for photography set ups there is usually the instruction of “move James from the set” however one time he did not move and you know what, after a frustrating 2 hours of trying to get coke bottles to look nice the cat jumps on the table behind them “wrecking the set” so as a laugh I took a picture and it was a fantastic picture and the class loved it and loved him, he is somewhat of a legend in my class as he has appeared in a number of my photo shoots either on the picture or on the side peeking into the set. We where meant for him, he picked us first and we went and well and truly brought him further into our hearts, we spoil him rotten, yes I know it is a little sticking your fingers down your throat and vomiting two weeks worth of digestion but having that large black fuzzy bundle of joy love you no matter what makes all the difference and makes him perfect. Sorry babs the cone will be off soon. This entry was posted in The 30 day Photo challange and tagged black cat, Photography. Bookmark the permalink.